It's Minerva Project time and I'm kind of in love with my latest make. It's safe to say we've skipped merrily into Autumn - does anyone else love this season as much as me? Who doesn't love all the beautiful colours of the leaves and that crisp smell in the air to say that Winter and....CHRISTMAS...is on the way? 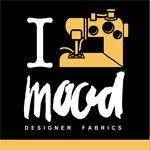 So, without further a do it's definitely time to break out the fall sewing. For my latest Minerva project I wanted another shirt dress. I am in love with shirt dresses. What can I say? Me and shirt dresses are going steady. Browsing through the patterns, I instantly got the hots for another McCalls version - M6600. I loved the 70s appeal of the styling, the big hat, tights and the loose fitting, casual elegance of the dress. The pattern has two versions. I went for version A, which is basically a loose fitting dress with a self-tie belt. Version B incorporates an elasticated draw-cord waist. The feature I like the most is that there are only 4 buttons on the front of the shirt - the rest is a seam down to the hem. Because the dress is so roomy, you just slip it over your head and then it's up to you how much skin you want to flaunt. The fabric is a bit of an unusual choice for me, but I really liked it when I saw it on the Minerva website. 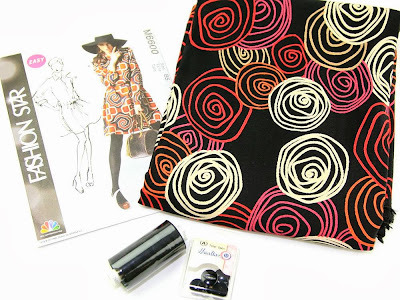 It's viscose and features awesome swirls in bright pink, orange, white and taupe. It's so funky yet without looking too in your face. I was a little nervous working with viscose to construct a shirt collar but it was actually fine. With the right interfacing, it's pretty much trouble-free. Cutting the fabric was also straightforward, I just made sure I pinned everywhere to prevent shifting. The beauty of this pattern is that it didn't require a muslin. It's designed to be loose fitting with the shaping coming from the belt. I love the 'blouson' effect around the waist. It's roomy but without looking over-sized. However, I did still pay attention to the flat pattern measurements and decided to cut the smallest size on the pattern - size 8. Even the 10 seemed like it would just be too big for me. I'm really pleased with this decision as the dress fits perfectly and pretty much matches the McCalls image on the pattern cover. I took off a few inches from the hem but otherwise I didn't make any alterations, and because this fabric is so light, I finished all seams by pinking. Simples! The instructions were very easy to follow. Techniques include yoke, shirt collar and collar band, button placket/facing, cuffs and I think this would be a nice project for a beginner sewer who is looking to extend their skills. The sleeves are constructed with the seam closer to the back so that you can create a pleat and a small 'rolled-hem' placket. There is a narrow cuff, which is fastened with a button. I chose these subtle shiny black buttons, which blend in nicely to the dress. The pleat joining the cuff gives a subtle blouson effect to the sleeve and the narrow cuff band fits snugly yet not too tight around the wrist. I'm wearing this dress with black bamboo tights and my winter faux-suede boots from Marks & Spencers. They have a kitten heel and are perfect for all-day wearing - bit of glamour with no pain for us big-footed girls. If you like this pattern and fabric combo, don't forget you can get it from the Minerva Crafts website, here!